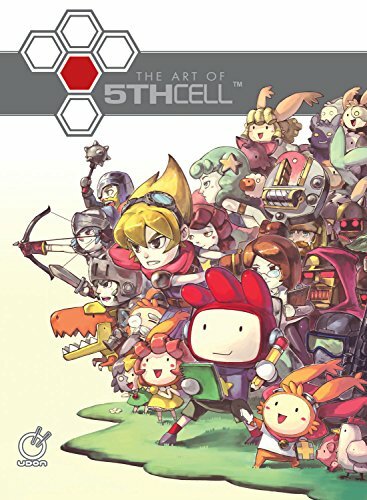 This is the artbook for the video game developer 5th Cell that was founded in 2003. The company is probably known more for their Scribblenauts series that came out in 2009. While the company has been around for a long time and has developed many game titles, not all of them have featured artworks in this book. The highlight for me would be the cartoon comic-like Scribblenauts art. I like the stylized designs of the characters and environment, drawn in a simple manner but well designed and looks great. The cute designs boil down to really simple forms, and character designs with little dots on their joints for animation. They are lovely looking. There are also several full coloured splash art pages with their line art versions. The book then moves on, or jumps back in time, to the more serious looking Lock's Quest with the character designs, background art and several pages of promotional comic. Then it's Drawn to Life with the even cuter character designs, props, storyboards, the game areas and beautiful maps. That is followed by the dead serious looking sci-fi shooter game Hybrid. After the bright and cheery colours from the earlier games, this section definitely feels a bit cold with the darker colours, paladin, weapons and sci-fi environment art. While the armoured suits look awesome, I feel that the simpler cartoon artworks of Scribblenauts are much more memorable. Next is the iOS game Run Roo Run. It's cool that 5th Cell is the company that do create both cute as well as serious looking games. The last few pages are sketches from artist Edison Yan, followed by the list of all 5th Cell original games from 2004 onwards, again strangely not arranged chronological order. Overall, it's a wonderful retrospective video game artbook for the fans. However, it's a bit confusing with the cute-serious-cute-serious-cute arrangement of the titles.